Working out with a friend can make the process more fun. It is nice having a buddy while you are running. However, there are benefits to working out with a friend that go deeper than simply adding fun. These benefits include increased motivation, increased happiness, and many other things. Weight Loss is a common goal for many people who work out. Almost any physical fitness regimen can help you achieve weight loss. However, research has shown that people who work out with someone else can lose up to 10 pounds more than people who work out alone. A large reason for this could be that friends can help you stay motivated throughout the exercise. By doing your workouts with a friend, you are more likely to maintain intensity and drive. Not only is it more fun, exercising with another person can add a friendly aspect of competition to the workout that will help you push yourself more. Most people who work out set specific times during the day that they plan to head to the gym. If you are exercising alone, however, it is easy to make up an excuse and skip the session, promising yourself that you’ll go the next day. If you have plans to do the workout with a friend, you let them down by skipping the workout. When disappointing someone else is one of the factors, you will be more likely to follow through to be accountable to your friend. Exercise is proven to improve mood and overall outlook. However, the American Journal of Health Behavior has reported that working out with a friend boosts your mood even more. People generally enjoy working out more when they are with someone else, so it will also help you remain happy and motivated during the workout, as well as after. Workouts are a great way to develop friendships. Exercise is emotionally and physically challenging in many ways. Facing the difficulties of exercise and fatigue together will help bond you to someone. The benefits of working out with someone else do not only apply to friends. Training with an expert can also be extremely valuable. Working with a knowledgeable professional can help you understand confusing or overwhelming exercises that might frustrate you if you were alone and couldn’t figure them out. Professionals can also help you stay on track with your exercise routine, as well as encourage you when you become exhausted or negative. You can also get these benefits from fitness classes. Not only do fitness classes have the advantages of an expert, they also offer you peers to work through the exercises. 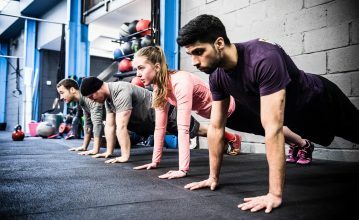 F3 Fitness offers many different workout classes that have small groups, so that you can have an experience that is more customized to your needs and abilities, while also having friends who will do the workouts with you. Contact the professionals at F3 Fitness for more information on our classes and to make an appointment to try one out for free.